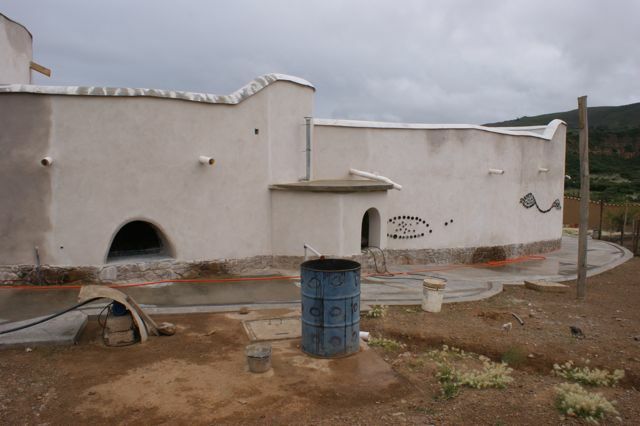 The heavy rain we experienced in January made us realize that the earth render we had applied to the external walls of the Roundhouse wasn't going to keep the rain off, even if we did paint with limewash. So we decided to use lime render mixed with sand to provide a breathable barrier against the elements. 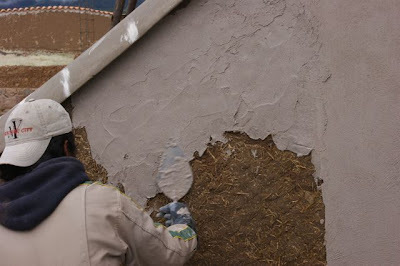 David worked around the house, gradually transforming the earth walls into creamy white. 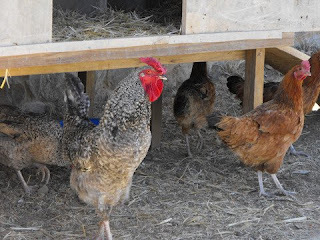 One of the first things we did on moving into the Roundhouse was to acquire some chickens - 5 hens and a rooster. 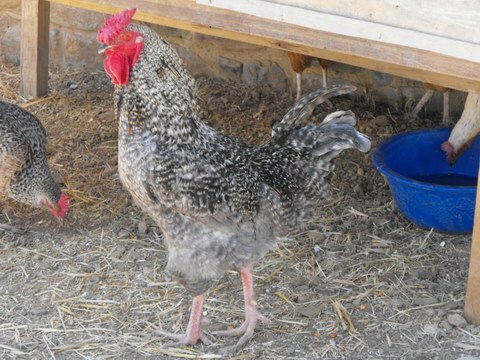 As the walls to the house are so thick, we weren't so bothered by rooster crows early in the morning and we thought he would take care of the hens. 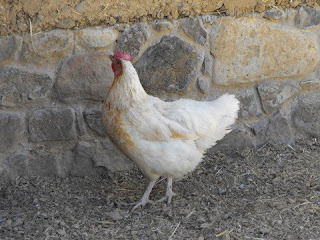 We get between two and four eggs each day and our feathered friends keep the ant population down. Mrs Midnight started hiding eggs and we let her hatch out a couple of chicks to add to the brood. Mr Midnight with some of his harem. Any chance we had of filling the pool in one shot in January was out of the question. For a start we could not find a big tanker to transport the water to our property, only small ones that were expensive. Using them would cost £400/$600 to fill the pool. Another factor was that after two months of drought conditions the rainy season came in with a vengeance. Continual downpours bounced mud and stones into the pool, and it was clear that we had to proceed straight away with terracing the pool. The good news was that we were able to fill our 11,000 litre cistern from our well four times a day as there was so much water being fed from the aquifer. Also we were harnessing a lot of rainwater from our huge living room roof which we fed into the cistern. 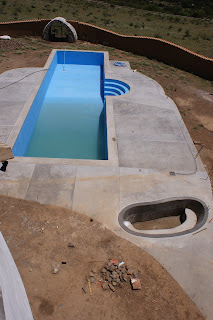 We decided to add a jacuzzi/spa during the work, which we would later tile with blue/green mosaic tiles to break up the large expanses of grey concrete. Once the terracing was completed around the pool we could start to fill it - a complete cistern-full every 5 days. 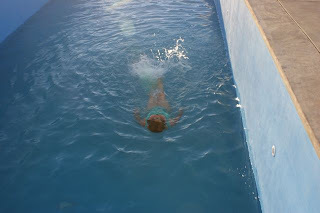 It was a slow process but as the pool filled we were able to swim at the deep end. A very dear friend of ours, Poppa Neutrino, has a great philosophy for living life to the full - the first class/fourth class trip. When you have the means, travel first class. When you don't, you travel fourth class and embrace it as part of life's rich pattern. In 2010 we had thrown our pot of money at our project with gusto. There was no question of us being careful, cutting corners, accepting a lesser result than our ideal. In any case, it was impossible to budget - we were designing a building that was unlike any other in Bolivia, we were experimenting with techniques that sometimes failed and had to be re-invented. 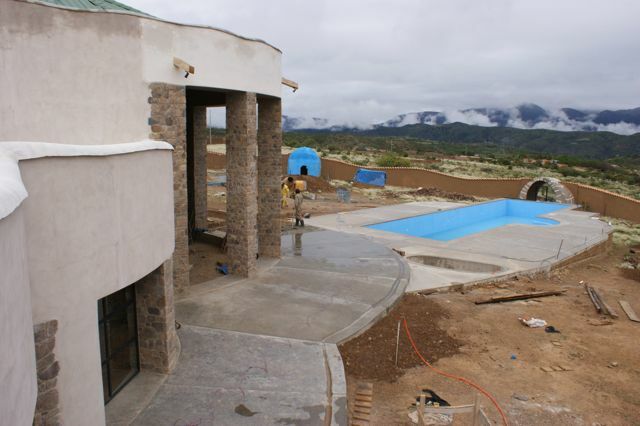 But we were so excited at the results as they appeared and at the positive feedback from visitors to Sky Hacienda and to this blog, it was difficult to feel defeated over our increasingly precarious financial situation. As we handed out our gift baskets and holiday pay to our workers at the Christmas break, we had broken the news to many of them that there was no more work for them for the time being. At one point during the year we had a workforce of 22, now we were reducing it to 5. We were entering the world of overdrafts, credit card debt and making do with very little income. Additionally, we had taken on a resident caretaker, Rosando who would be in charge of the security of Sky Hacienda and helping with the creation and maintenance of the gardens. Eventually his wife and two daughters would come to live on the property when we had built a house for them. Our ideas on how best to create a successful business out of Sky Hacienda had shifted as the project had progressed. The initial plan had been based on the quintessential large country house in England, where friends would be invited for an intimate weekend to relax, have great conversations, walk in the grounds, lounge by the pool, eat great food, dance under the stars, fireworks, picnics......but the 'friends' would be paying guests. Then we had shifted to building a large restaurant/bar with modest living accommodation above or nearby and cottages in the grounds for our paying guests. Back in August 2009 as we started marking out the foundations for the Roundhouse, which was to be our home, the walls seemed anxious to expand. After a visit to France last summer to see our friend Tom, who had magnificently converted a barn into a home and studio, with its soaring beamed ceilings, I got on the phone to Ed. We had to make the living room double height, with a mezzanine running around most of the perimeter. The flat roof terrace we had built over the single storey section was vast and now the living room roof was expanding too. At 12.5 metres in diameter it became clear that the Roundhouse was going to be much too big for the two us, but perfect for sharing with guests. We would live in the single storey section, and our guests would eat and relax with us in the living room, outside on the terrace, on the roof terrace, in the garden, around the pool.... We had returned to the initial idea, a large house in the country with guest cottages. With our new crack team of builders lead by Geronimo, we took a deep breath and started working to finish the Roundhouse and the grounds so that we reverse the flow of money. We had come so far and were determined not to lose sight of our dream. 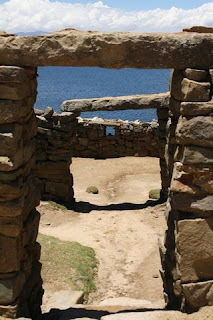 New Year's Day saw us up bright and early and on the road to Lake Titicaca. 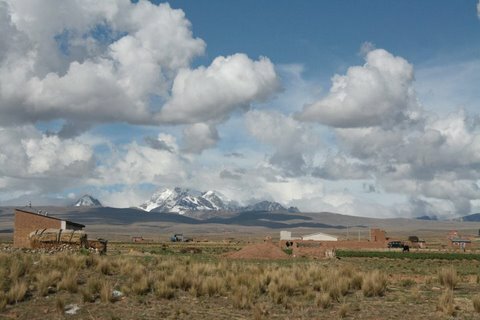 As we approached La Paz we could see the snow capped mountains - more prevalent in the summertime as it is also the rainy season. 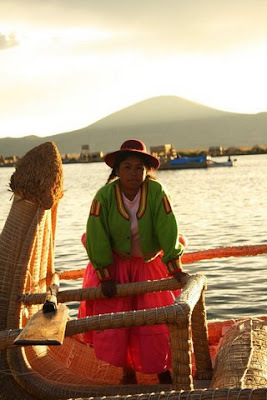 We had a quick lunch in La Paz, then pressed on to Copacabana where we would be staying on the shores of the highest lake in the world, at over 3800 metres, and the cradle of the Inca civilization. 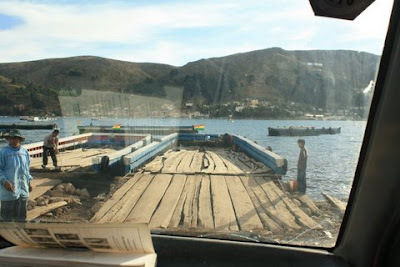 We had to take a ferry across the lake to Copacabana. The photo above, taken inside our minibus as we drive on, looks pretty scary. Ed and I were completely unfazed having had plenty of rafting adventures with the Floating Neutrinos. The next day we took a boat trip to the Isla del Sol, the birthplace of the Incas. It was our second visit to this beautiful island, but a first for Kitty. We hiked up to the Temple of the Sun and explored the ancient chambers and passageways. Our final day on Lake Titicaca took us on a short trip just over the Bolivian/Peruvian border to Puno, where we took a boat to the Floating Reed Islands. These forty two islands are inhabited by the Uros, a pre-Inca people, and each island is named and decorated with a reed sculture. This is Flamingo Island. 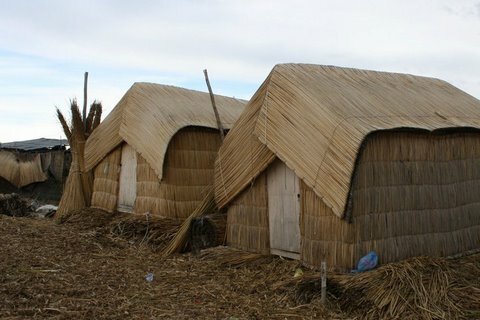 The Uros live in huts fashioned from dried tortora reeds. 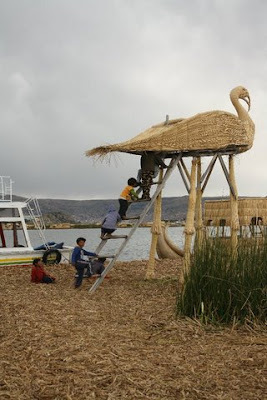 These same reeds are harvested from blocks growing in the lake which are tied together to form the islands. They can be moved and tied to other islands. The soft part at the base of the reed is used as a food and to make tea. The reeds are also used to make elaborate boats that ferry the Uros to the different islands. Modern boats are used to access the mainland. The women earn money from selling handicrafts to the visiting tourists. They are physically very strong and can move the huge reed boats single-handed. 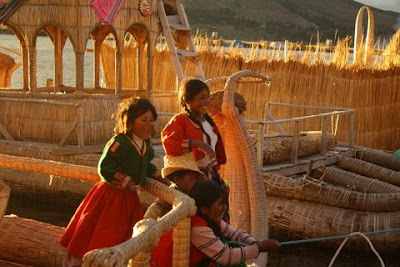 The Uros have an agreed monopoly on fish farming on Lake Titicaca, inside the boundaries of the floating islands. The trout we eat in Sucre comes from this area. 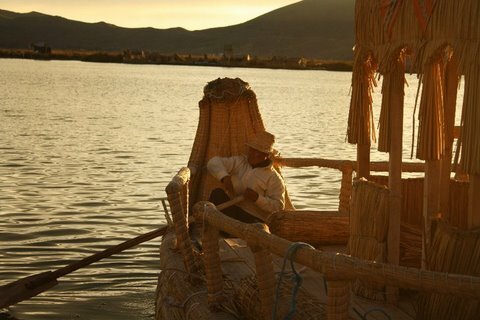 As the sun descended on Lake Titicaca our holiday was drawing to a close. The following morning Kitty boarded a bus to Lima and we headed south, refreshed from our short break and ready for the next phase of building at Sky Hacienda.